Description A Group for High Resolution Sea Surface Temperature (GHRSST) Level 4 sea surface temperature analysis produced as a retrospective dataset (four day latency) at the JPL Physical Oceanography DAAC using wavelets as basis functions in an optimal interpolation approach on a global 0.011 degree grid. The version 4 Multiscale Ultrahigh Resolution (MUR) L4 analysis is based upon nighttime GHRSST L2P skin and subskin SST observations from several instruments including the NASA Advanced Microwave Scanning Radiometer-EOS (AMSRE), the Moderate Resolution Imaging Spectroradiometer (MODIS) on the NASA Aqua and Terra platforms, the US Navy microwave WindSat radiometer and in situ SST observations from the NOAA iQuam project. The ice concentration data are from the archives at the EUMETSAT Ocean and Sea Ice Satellite Application Facility (OSI SAF) High Latitude Processing Center and are also used for an improved SST parameterization for the high-latitudes. This data set is funded by the NASA MEaSUREs program (http://earthdata.nasa.gov/our-community/community-data-system-programs/measures-projects), and created by a team led by Dr. Toshio Chin from JPL. Citation JPL MUR MEaSUREs Project. 2010. 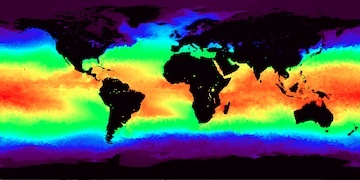 GHRSST Level 4 MUR Global Foundation Sea Surface Temperature Analysis. Ver. 2. PO.DAAC,	CA,	USA. Dataset accessed [YYYY-MM-DD] at http://dx.doi.org/10.5067/GHGMR-4FJ01.